The Board of Directors’ Build has become an annual tradition, of which I’m honored to be a part! This year’s build is especially exciting as it will be the 300th house that Austin Habitat has built. 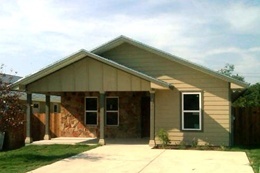 In addition, the 2011 Directors’ Build will kick off the construction of a new neighborhood, Sendero Hills. As a Board Member of Austin Habitat for Humanity, I truly believe in the vision to eliminate poverty housing through the power of homeownership. Safe and stable homes are the foundation of successful families and communities. But owning a home is not possible for many of our neighbors. As a result of the affordable housing crisis in our community, many families live in overcrowded, deteriorating apartments in crime-ridden neighborhoods. Most of these families are spending the majority of their income on housing, and have little money remaining to pay for other basic necessities, such as food, healthcare, and clothing. Loss of a job or any unexpected expenses, such as a high medical bill, could mean an inability to make rent, forcing families to live in unstable transitional housing or worse...on the streets. Please join with me in creating hope and stability for families in need. Make a donation today to help end the cycle of poverty housing in our community.